The MT2000 Series combines the simplicity of a scanner with the intelligence of a mobile computer, providing advanced 1D/2D bar code, DPM and image capture, as well as the ability to key in and view data. 802.11a/b/g, Bluetooth, corded and batch connectivity options provide the flexibility to meet a wide range of applications, and the ergonomic yet rugged design offers comfortable, reliable operation throughout your environment. The MT2000 Series represents another industry first from Motorola — the marriage of the simplicity of a scanner with the brainpower of a mobile computer and an ultra-ergonomic gun-style form factor. The result is a handheld mobile terminal, a highly flexible device capable of streamlining many scan-intensive business processes in a wide variety of industries — from the front to back door in manufacturing plants, retail establishments, warehouses, hospitals and more. The easy-to-use affordable mobile terminal offers a unique hybrid design, able to function as both a scanner and a mobile computer throughout the business day. 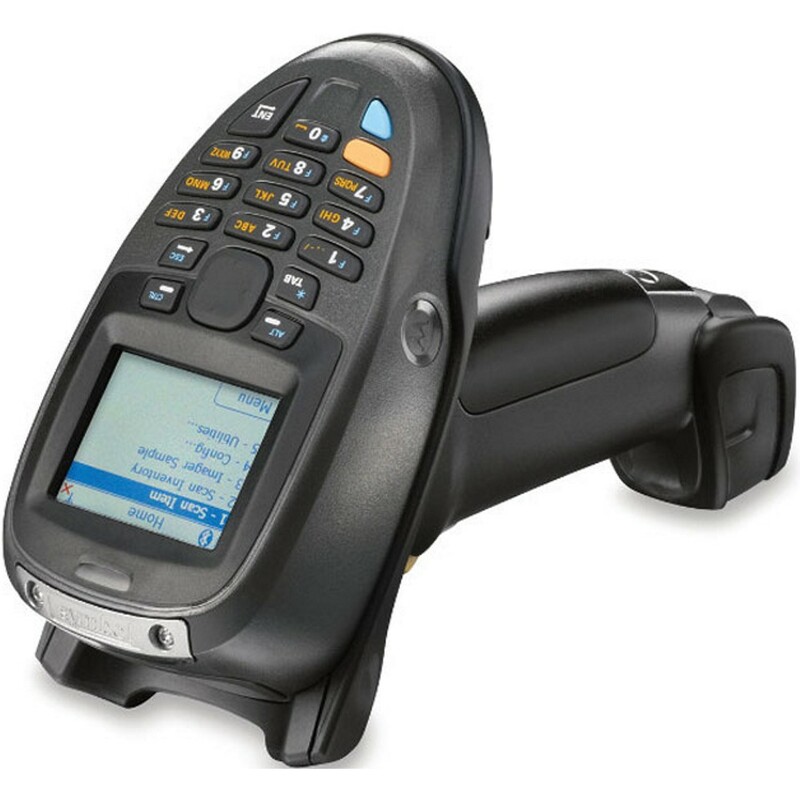 The MT2000 Series can be utilized right out of the box as a scanner — either tethered to a point of sale (POS), laptop or other computing system — or as a standalone wireless mobile computer capable of enabling inventory and other scan-intensive applications anywhere in the enterprise. Two models provide the flexibility to meet a wide variety of business needs — the MT2090 and the MT2070. The MT2090 offers integrated 802.11a/b/g for real-time direct application connectivity anywhere in your environment, ideal for put-away and picking in the retail backroom and warehouse aisles to material tracking, quality control and error-proofing on the manufacturing floor. Both models offer integrated Bluetooth® for a convenient cordless connection to a host device up to 300 feet (91.44 m) away — such as a Point-of-Sale (POS) or workstation. The MT2000 Series can operate in real-time or batch mode, increasing application flexibility. And regardless of whether the device is connected to your wireless LAN or to a host device, support for the latest wireless security protocols keeps your data safe — and helps ensure compliance with PCI and other government regulations. The MT2000 Series is loaded with advanced data capture capabilities. The industry-leading 2D imager provides the flexibility to capture 1D and 2D bar codes as well as signatures, images and video. In addition, the world-class 2D imager re-sets the bar for imaging technology, providing extraordinary scan speeds on both 1D and 2D bar codes — eliminating the need for businesses to sacrifice scanning performance for 2D capability. The MT2000 Series exemplifies Motorola’s expertise in industrial design. The handle-forward design balances easily in the hand and combines with a gun form factor, bringing all day comfort to even the most scan-intensive applications. The shiftable alphanumeric keypad helps ensure easy data entry — regardless of whether your applications require primarily numeric or text-based entry — or both. And soft keys enable the completion of a wide range of actions with the single press of a button. This entry level value-priced mobile terminal offers the same drop specification as Motorola’s high-end rugged devices — a 6 ft./1.8 m drop test performed across the entire operating temperature range. You get reliable performance whether the device is dropped at room temperature on carpet or tile — or out on the loading dock and in outdoor shopping areas in extreme winter cold or summer heat. While the drop specification defines the maximum survivable impact height, the tumble test defines endurance — the MT2000 Series experienced no degradation in performance after 250 tumbles in a rotating drum, which subjects the device to 500 consecutive 3.2 ft./1 m drops. And IP54 sealing provides dependable operation in spite of exposure to dusty environments or splashing liquid, such as a beverage spill.